Palermo was a surprise. I didn’t know what to expect, because the only images I had in my head were the Sicilian gangsters of early 20th century America and the assassination of Mary Corleone in The Godfather Part III, which took place on the steps of the Teatro Massimo, Italy’s biggest opera house and one of Palermo’s greatest landmarks. In other words, I pictured the Mafia and little else. What I encountered was a city with great coffee, back alley markets and bustling streets relatively untouched by tourism and gentrification. Compared to the earnest orderliness of Munich, where I had spent a couple of days before going to Italy, Palermo has a certain grimy insouciance that I find endearing. Palermo is Sicily’s largest city and also one of its oldest, having been founded by the Phoenicians more than 2,700 years ago. It sits in the island’s northeast, on a stretch of coastline punctuated by limestone mountains. They guard the city in every direction, their watchful stare visible from every major street. 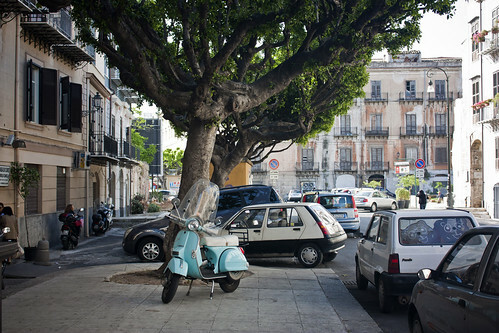 Palermo’s population nearly doubled in the 1950s and 60s, and much of the city is dominated by hastily-built apartment blocks that give it a shoddy, crowded appearance. 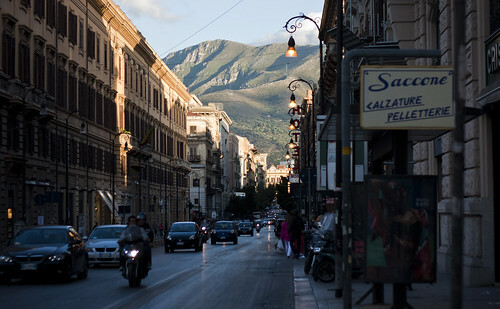 The so-called “Sack of Palermo” obliterated much of the nearby countryside and led to the neglect of its historic centre, but it also gave the city a noisy vitality. The building boom was controlled by the Mafia, a traditionally rural beast that took advantage of the postwar power vacuum to establish a foothold in the city. With the blessing of corrupt municipal officials, Mafia contractors tore down historic landmarks with impunity and threw up thousands of illegal apartment buildings. “Mafia organizations entirely control the building sector in Palermo — the quarries where aggregates are mined, site clearance firms, cement plants, metal depots for the construction industry, wholesalers for sanitary fixtures, and so on,” noted anti-Mafia prosecutor Giovanni Falcone in 1982. 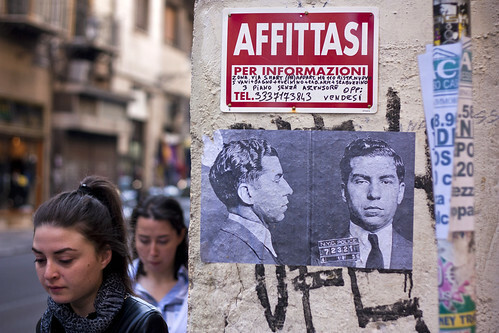 Though the Mafia’s global role has been usurped by other criminal organizations, it remains influential in Sicily, where 70 percent of businesses are still believed to pay pizzo, or protection money, to the Mafia. 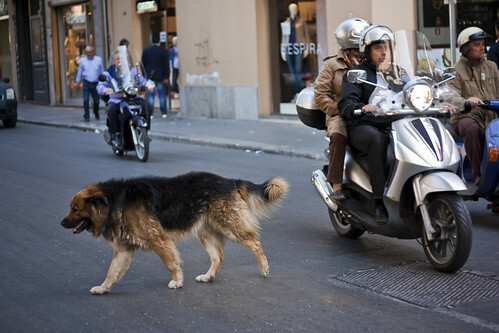 Given this history, is hard to disassociate Palermo from organized crime. Even the airport is a reminder, named after Falcone and his ally Paolo Borsellino. The two prosecutors dealt a devastating blow to the Mafia in 1986, only to be killed in retribution several years later. 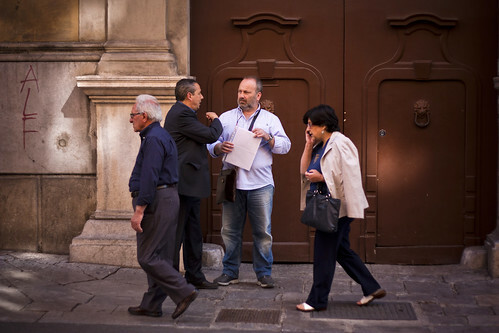 The Addiopizzo movement, in which business owners publicly oppose paying protection money, has been successful, but it only underlines the way the Mafia remains present in day-to-day Sicilian life. It’s obvious even to a visitor. Late on a Thursday afternoon, as I wandered up to the fountains and banyan trees of the Giardino Inglese, I began to notice one or two men lingering on every block, eyeing cars as they passed. Nearly all of them were African or South Asian. 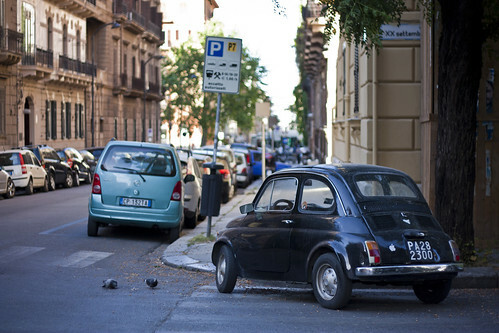 When a dinged-up Fiat passed by slowly, looking for a parking spot, one of the men would wave the driver into a free space. Afterwards, they would exchange a few words until the driver offered some coins. 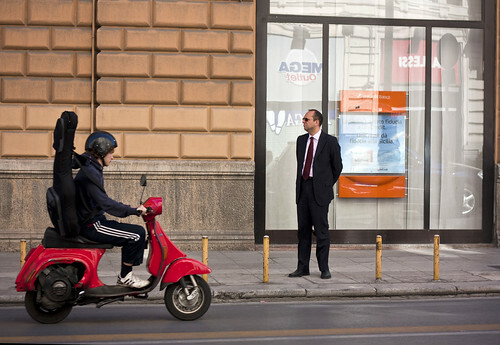 The driver would then walk away, ignoring the signs asking her to buy a parking ticket from one of the streetside machines, which charged one euro per hour. I thought of a story I’d read about Johannesburg’s self-employed “car guards,” who ask drivers for a small fee in exchange for watching over their cars. But this seemed altogether more organized, and it eventually dawned on me that the men standing on ever block were asking for a kind of pizzo. Turns out there’s a name for these men: posteggiatori. You can even play a posteggiatori in a game for the iPad, though it doesn’t seem like it would make for particularly riveting gameplay. This entry was written by Christopher DeWolf , posted on Monday May 28 2012at 07:05 am , filed under Europe, History, Public Space, Society and Culture, Transportation and tagged Crime, Exploring the City, Italy, Palermo, Parking, Sicily, Streetlife . Bookmark the permalink . Post a comment below or leave a trackback: Trackback URL. 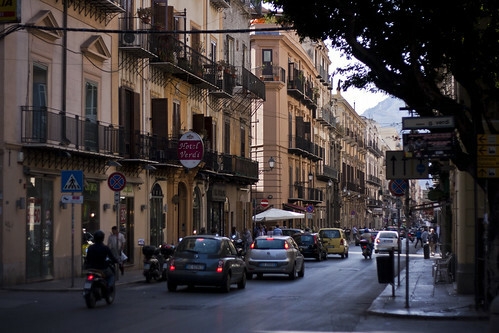 Pictures you took are great and capture quite well the spirit of those streets.. how long have you been in Sicily ? Hi Daniel! I was in Palermo for less than 24 hours (arrived in the afternoon, left the next morning) and in Sicily for just two and a half days. It was a work trip.